How do I get my 7-year old daughter to stop trying to get out of chores? I have tried everything except spanking. I do not believe in physical punishment at all for any reason. Thanks. 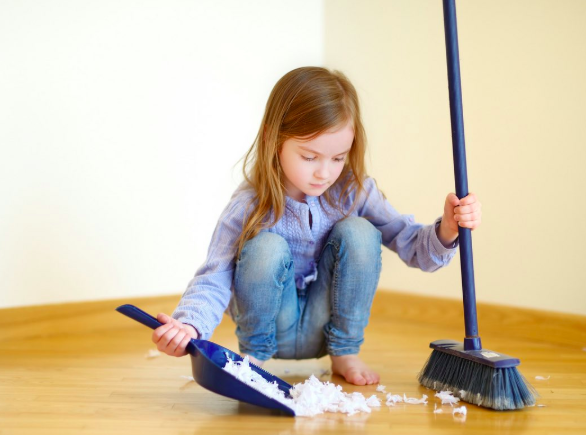 If you scold or lecture your daughter in an effort to convince her that she should care about tidying up the bathroom or sweeping the patio, you’re not likely to get a cheerful response. • Write 10 things that need to be done onto slips of paper and drop them into a hat. When it’s chore time, invite her to reach into the hat to find out what she’s responsible for doing this week. • Create a bit of fun when it’s chore time. Play loud music and have your daughter tidy up the living room for the duration of one or two songs. Or make a contest where you give everyone in the family a paper bag to toss in trash or items that need to be put away. Whoever has the fullest bag after 10 minutes can be crowned the Triumphant Trash-Nabber! Need more ideas? Join me with Patty Wipfler from Hand in Hand Parenting for our Master Class February 20th on Teeth Brushing, Room Cleaning, Chores & More! Parents do things endlessly for their children, and it’s easy to feel shortchanged when they resist helping out. But I commend you for recognizing the importance of teaching your daughter to take responsibility for helping maintain the family home. And I’m especially glad that you understand how harmful physical punishments are to a child’s sense of safety, connection and self-esteem. P.S. Join me with the wonderful Patty Wipfler from Hand in Hand Parenting for a special Master class on Chores Wednesday, February 20th at 12:00 pm. Replay available if you can’t attend live. Details here!